THE BRIGHT NOON SUN beat down on the stone walls of the Church of St. George in Palos, Spain. Inside, in the cool quiet, knelt Cristóbal Colón, captain general of three small ships anchored in the town’s inlet below. With Columbus saying confession and hearing mass, were some ninety pilots, seamen, and crown appointed officials. Later that day they would row to their ships, Colón taking his place on the Santa María, a slow but sturdy flagship no longer than five canoes. The next morning, Friday, August 3, 1492, at dawn, the Santa María and its companion caravels caught the ebb tide and drifted toward the gulf. Their sails began to fill, and the crosses boldly emblazoned on them caught the light. Their mission—the wild-eyed idea of their foreigner captain—was to sail west, away from all visible landmarks. They would leave behind Spain and Portugal, the “end of the world, ” and head straight into the Mare Oceanum, the Ocean Sea. In that Ocean of Darkness, some feared, the water boiled and sea monsters gulped down sailors so foolish as to sail there. Beyond—if they lived to see it—lay the fabled island of Cipangu. There, in the land of the Great Khan, houses were roofed with gold, streets paved with marble. And this was but one of 7,448 islands Marco Polo had said were in the Sea of China. But even if they reached the Indies, how would they get back, since currents and winds all seemed to go one way? Why Take the Risky Voyage? Commander Cristoforo Colombo (as he was known in his hometown of Genoa, Italy) was taller than most men; so tall, in fact, he couldn't stand inside his cabin on the Santa María. He'd had “very red ” hair in his younger years, but since he'd passed age 40, it had turned prematurely white. His face boasted a big nose and freckles. Columbus, as we know his name today, was an experienced mariner. He had sailed the Mediterranean and traveled to parts of Africa, to Ireland, and probably even to Iceland. He boasted later in life, “I have gone to every place that has heretofore been navigated. ” He knew the Atlantic as well or better than anyone, and he probably knew more about how to read currents, winds, and surfaces of the sea than do sailors today. “He [our Lord] has bestowed the marine arts upon me in abundance, ” Columbus said. Why? Why would someone, anyone, doggedly spend years getting funding for a death-defying feat? There may be many things we don't know about history’s most famous mariner. We don't know exactly what Columbus looked like. We don't know the precise design of his three ships. And most bizarre of all, we don't know—and will probably never know—the spot where he came ashore. It was typical for Spanish crewmen daily to recite the “Our Father ” and other prayers. Columbus’s men did, too. But Columbus went far beyond conventional practice. His son Ferdinand wrote, “He was so strict in matters of religion that for fasting and saying prayers he might have been taken for a member of a religious order. ” He knew his Vulgate Bible thoroughly, and he probably took it (or a collection of Scriptures) on his voyages. Whenever he faced a storm, a waterspout (tornado-like whirl of seawater), or rebellious crewmen, he made vows to God. “Religion was always his first refuge in adversity, ” writes Columbus scholar Felipe Ferñandez-Armesto. Evangelical? In 1501 Columbus wrote, “I am only a most unworthy sinner, but ever since I have cried out for grace and mercy from the Lord, they have covered me completely. I have found the most delightful comfort in making it my whole aim in life to enjoy his marvelous presence. ” He constantly associated with reform minded Franciscans and spent perhaps five months at the white-walled monastery of Santa María de La Rabida. He may have been a member of the Franciscan Third Order (for lay people). At least once he appeared in public wearing a Franciscan habit and the order’s distinctive cord. But only in the last 40 years—and particularly in the last 10 have scholars examined Columbus’s religious motivations. Not until last year was his most important religious writing—the Libro de las profec√≠as, or Book of Prophecies—translated into English. Columbus’s deep Christian faith still causes academic bewilderment. Some scholars attribute his recurring encounters with a heavenly voice to mental instability, illness, or stress. Others complain that Columbus’s biographers described him as more religious than he really was. Some protest that Columbus was greedy and obsessively ambitious, so he couldn't have been truly religious, as if competing qualities cannot exist in one person. But why explain away his intense religious devotion, when it was obvious to those who knew him and persistent throughout his writings? On September 23, the ship hit a calm, causing the seamen to complain they'd never be able to get back to Spain. But later, the sea rose without the aid of any wind. This “astonished them, ” and Columbus compared it to the miracles that accompanied Moses. After going a month without seeing land, the men belly-ached about the endless voyage. But on October 11, the ship’s log records, they began seeing signs of shore: seabirds, bits of green plants, stacks that looked they had been carved, a small plank. At 10 that evening, Columbus saw a faint, flickering light like a candle in the distance. Few took it as a sign of land, but when the crew gathered to sing Salve Regina ( “Hail, Queen ”), Columbus instructed his men to keep careful lookout. He would give the first person to sight land a silk jacket and 10,000 maravedis. Then the Pinta( “Painted One ”), the fastest of the three ships, sailed ahead. At about 2 A.M., a crewman yelled “Tierra! ”—land. At daylight, the wide-eyed Europeans saw people “as naked as their mother bore them ” and many ponds, fruits, and green trees. Columbus and his captains went ashore in an armed launch and unfurled the royal banner and two flags. Each was white with a central bright green cross flanked by a green F and Y for “Ferdinand ” and “Isabella. ” Columbus declared that these obviously inhabited lands now belonged to the Catholic sovereigns. Now here he was, standing in the distant isles of the Indies. So he called the Taino-speaking peoples of the Arawak tribes “Indians. ” The name, though flatly wrong, stuck. Soon many natives gathered. They had coarse black hair— “almost like the tail of a horse ”— with “handsome bodies and good faces ” painted with black, red, or white paint. “I recognized that they were people who would be better freed [from error] and converted to our Holy Faith by love than by force, ” Columbus concluded. In other words, they would make good Christians and good slaves. The cross and sword had come together. The modern concept of separating church and state had never entered Columbus’s mind. His sovereigns were Christian princes; to extend his nation’s borders was to extend Christianity; to conquer and enslave new lands was to spread the gospel. Even when Columbus forcibly subjugated Hispaniola in 1495, he believed he was fulfilling a divine destiny for himself and for Aragon and Castile and for the holy church. Columbus was the advance man for a mighty evangelistic campaign. He would open new worlds and unseen peoples to the gospel. In a sense, he would be like the legendary giant Christopher, who carried Christ on his back across a wide river. He also, a Christopher, a “Christ-bearer, ” would carry Christ across the wide Ocean Sea to peoples who had never heard the Christian message. And especially Isaiah 60:9— “For, the islands wait for me, and the ships of the sea in the beginning: that I may bring thy sons from afar, their silver and their gold with them, to the name of the Lord thy God. ” In Columbus’s mind, the islands were waiting for him; he would bring their sons to the Lord (and not incidentally, bring their silver and gold as well). Las Casas agreed that “Columbus showed the way to the discovery of immense territories ” and many peoples “are now ready and prepared to be brought to the knowledge of their Creator and the faith. ” As a sign of that work, on every island he explored, Columbus erected a large wooden cross. After ten weeks of exploring the coastline of Cuba and Hispaniola, continually trading trinkets for gold, Columbus and his men hit a problem. In the wee hours of Christmas morning, a sailor decided to catch some sleep and left the tiller in the hands of a boy. The Santa María ran aground. But what most would have viewed as a calamity, Columbus did not: “It was a great blessing and the express purpose of God ” that his ship ran aground so he would leave some of his men. Yes, the ship was wrecked beyond repair, but now he had lumber—lots of it—for building the necessary fort. He left a small garrison of men with instructions: treat the natives well and don't “injure ” the women; explore for gold; seek a place for permanent settlement. The storm raged on. On February 14th, Columbus gathered his crew on the heaving and rolling deck to pray and make vows. They put chick-peas in a cap and had sailors draw to see which one picked the chick-pea with a cross cut into it. That sailor would go on a holy pilgrimage to a shrine of the Virgin Mary if they landed safely. Columbus drew the cross-marked bean. Apparently, on that frightening day, Columbus also heard a celestial voice. In his youth, he felt God had promised him that his name would be proclaimed throughout the world. And at age 25, he had survived a shipwreck and six-mile swim—a sign, he told his son Ferdinand, that God had a plan for him. But this was different. Although the words are recorded only indirectly, God spoke to Columbus and assured him that God would take him to safety. God had given him great favor in allowing him to accomplish this great feat. God would allow him to complete what he had begun. The next day Columbus’s men spotted an island in the Azores; less than three weeks later they landed triumphantly on the Iberian peninsula. Ferdinand and Isabella, who had just united their kingdoms, soundly defeated the Moors, signaling the end of an Islamic presence in Europe. The Catholic sovereigns had expelled all Jews and seized their assets. Columbus had used the port of Palós, in fact, because the larger C√°diz was flooded with thousands of fleeing Jewish refugees. A Spanish pope had been elected. And now this—a new gateway to the Indies. A new country, militantly united behind Christianity, had arisen and would dominate the world for a hundred years. To Columbus, all this was a sure sign of the end times. For years a prophecy had circulated that “the restorer of the House of Mt. Zion will come from Spain. ” For hundreds of years, the holy sites of Jerusalem had been held captive by the infidel Muslims. But according to ancient prophecy, that day would soon end. And Columbus believed he would be part of making it happen. Following St. Augustine’s teaching, Columbus knew that all history fell into seven ages—and he was in the sixth, the next to last. Furthermore, Augustine had said the world would end 7,000 years after its creation. That was a mere 155 years away, and much had to happen: all peoples of the world would convert to Christianity, the Holy Land would be rescued from the infidels, the Antichrist would come. Not that he would personally lead the armies. No, he would help pay for the expensive crusade. The Crusaders‚Äô Book of Secrets, written in the early fourteenth century, said it would take 210,000 gold florins to mount a crusade. If Columbus could find enough gold in the Indies especially if he could find the lost mines of Solomon, which were known to be in the East—he could pay for a Holy Land crusade. Columbus thirsted for gold; he was obsessed by it. When he says sincerely, “Our Lord in his goodness guides me so that I may find this gold, ” we cringe. But writers who accuse Columbus of raw greed miss part of the point. Columbus wanted gold not only for himself, but also for a much larger reason: to pay for the medieval Christian’s dream, the retaking of the Holy Land. “The primary motivation in his quest for gold was spiritual, ” argues Delno C. West. But much to Columbus’s disappointment, the longed-for crusade to recapture the Holy City was never undertaken. Although Ferdinand and Isabella made military strikes into Muslim-held North Africa, they never mounted a grand crusade. His wanderlust. He took three more voyages across the Atlantic, each lasting several years and filled with harrowing storms, crew rebellions, illnesses (at one point his eyes bled), and encounters with native Americans. His passion for evangelism. In May 1493, he asked Ferdinand and Isabella to set aside 1 percent of all gold taken from the islands to pay for establishing churches and sending monks. They instructed him “to win over the peoples of the said islands and mainland by all ways and means to our Holy Catholic Faith ” and sent 13 religious workers on his second voyage. 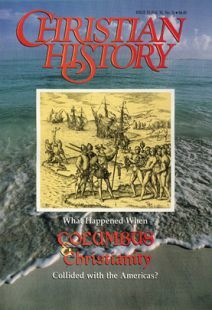 In his will, Columbus instructed his son Diego to support from his trust four theology professors to live on Hispaniola and convert the Indians. His inflexibility. To his death he continued to argue (against other evidence) that he had landed in Asia. As a colonial governor, he ruled the farmers and settlers with such a heavy hand they rebelled. Columbus was arrested and shipped back to Spain in chains. His drive for titles and money. Columbus became absolutely wealthy, “a millionaire by any standard. ” But he had driven such a hard bargain with the crown—hereditary titles and “the tenth part of the whole” of gold he found—that the monarchs continually had to limit his power and wealth. Columbus spent his last years in legal battles and worries that his estate would be whitled away. His encounters with the voice of God. Columbus had at least two more, both in dark hours. His belief in his role in end-times prophecy. Late in life, with the help of a friend, a monk, Columbus assembled excerpts from the Bible and medieval authors. The unfinished work, titled Book of Prophecies, uses Scriptures to show that God had ordained his voyages of discovery and that God would be doing further wonderful things for the church. Some have criticized Columbus for the “providential and messianic delusions that would come to grip him later in life ” and accused him of megalomania. Kevin A. Miller is editor of Christian History. How much did Christians borrow from Greek and Roman religions? As George Whitefield blazed across England, Scotland, and America, his dramatic preaching caused excitement bordering on panic.